Airsports Flying School is proudly Australia's oldest Sport Aviation Flying School. We have taught pilots from all over Australia and around the world on how to fly sport aircraft. If you fly with AirSports you have an experienced team that will show you how to fly. We only fly modern twin seat CASA type approved sport aircraft. AEROSHOP, Australia's first sport aviation pilot shop (Click here) has available a complete range of aviation equipment and accessories specifically for sport and recreational aviation pilots. ✓	It's a country Airfield at Riddells Creek, no aircraft traffic so you can train with ease. ✓	Sealed all weather runway so spend more days flying. ✓	Safe flying training area, no need to fly over built up areas or no go zones. ✓	No landing fees to pay, no air navigation charges and no need for an ASIC security card, save $'s. ✓	No extra charge for briefing time, if you have any questions just ask, saving hundreds of $$'s. ✓	No charge for sitting, marking, or reviewing any written tests. ✓ No time wasted taxiing your aircraft, a potential saving of 25% of your training costs!! ✓ The best view in Melbourne with the Macedon ranges, Hanging Rock and the vineyards nearby. Like to learn? Why not take an introductory flight. Fly our aircraft with the guidance of an AirSports flight instructor, it's exciting, a challenge and a great experience. On a trial flight your flight instructor will hand over the flight controls to you. Fly the top of the line TOPAZ a new, modern, comfortable, high wing aircraft with side-by-side seating. Order an AirSports pre-paid flight certificate on line using your credit card and PayPal. We fly Wednesday-Sunday inclusive (if the weather permits). Prior flight bookings are recommended. If your are interested in learning to fly with AirSports please see our COSTS page for full details. ... when you are ready to fly please phone us AirSports Flying School on "0422 446622", and book your flight! 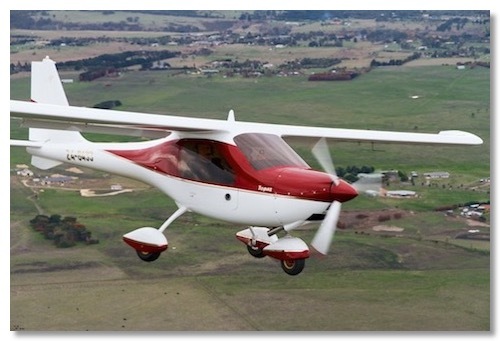 AirSports is the Australian and New Zealand distributor of the TOPAZ light sport aircraft. See more at our FlyTopaz.com website. The Topaz offers a really comfortable cockpit, amazing climb capability, excellent easy control and a superb glide capability (with a glide angle of 17:1), see our video (above) for a flight demonstration. The above video and this website is best viewed in Safari or Chrome, some loss may occur in FireFox. For a direct video link click here. Riddells Creek Airfield, Melbourne Victoria, Australia.